Roadtripper Ride-On Car is rated 4.9 out of 5 by 11. Dimension (in) 11" x 19" x 10.5"
Rated 5 out of 5 by Redsgirl2015 from Cute, colorful and entertaining My daughter is just at the stage to play with the Roadtripper Ride-On Car. Cute and colorful this toy can be pushed or ridden. The batteries are also included. This is a fun and educational toy. The activity toys are located on the dash and hood. Which include a horn, gears that shift and spin ,a horn , a radio, and a steering wheel. And there is music at the push of a button. It is sturdy and can be wiped clean with a damp cloth. There is a lock button to secure the different modes from riding to pushing. So no fear that your little one can be hurt. I'll love watching her as she's being pushed and as she advances to the walking stage. A great toy. Rated 4 out of 5 by AjMem from Music Groving Car My review for the Roadtripper Ride-On-Car was very pleaseant for me and my toddler. My toddler loved listening to the music on the Ride-On Car and it had a high and low setting to control the music level. And most of all my toddle love the horn sound. He was able to imatate our car horn. Rated 5 out of 5 by RogFam from Very Sturdy My boys love this toy. It's great for all ages, even they neighbor kids who are 9 were riding it while being pushed, this thing can rally! It's got all of the bells and whistles from a horn, to songs, and a handle on the back. We even ride it down the hill in our yard. A well built toy that is for sure! Rated 5 out of 5 by MrsLanier from This is the best ride on car This product is great! I love that it encourages my little guy to walk! A great addition is the melody of toys in the front of the car my son just loves to sit an play with them. And of course you cannot go wrong with just sitting on the car and riding it that way, sometimes I give him a little push. This push car is perfect and is very well made, even the packaging is cute! Rated 5 out of 5 by Katlinwatts15 from Ride on car I absolutely love theses ride on cars! I get one for all of my kids as they are gaining independence! It’s so perfect to helping learn to walk and it keeps them entertained! Rated 5 out of 5 by Katlinwatts15 from Ride on car I absolutely love theses ride on cars! I get one for all of my kids as they are gaining independence! It's so perfect to helping learn to walk and it keeps them entertained! Rated 5 out of 5 by ShelleyB from "Look out, Mom!" The kids love this! 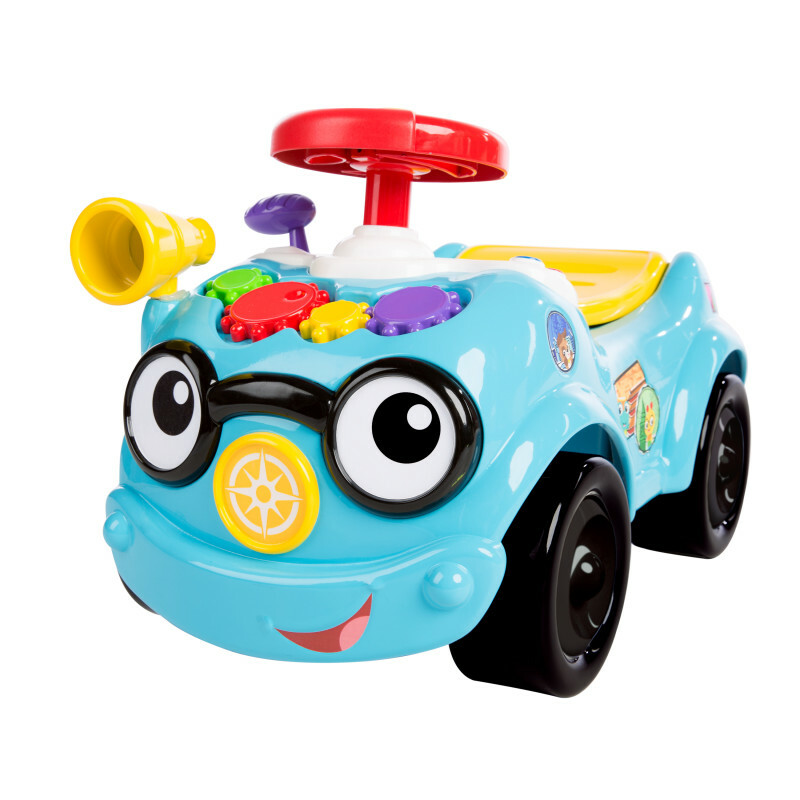 It didn't take long after removing the Baby Einstein Roadtripper Ride-On Car from the box to become a big hit! My kiddo was one the go, riding around, honking the horn and saying "look out, Mom!" as he literally aimed for me. Oh, but I didn't mind, I enjoyed seeing the joy on his face. I tried to show him that he could push it too with his stuffed animal on it, but he had nothing to do with that. It's definitely about the ride! It has lots of activities on it as well! He loved the spinning gears and the horn of course! Also liked shifting gears and turning on the radio. (it plays music, but it's kinda loud!) Overall it's been a favorites since it was opened and still is a week later!